Global credit intermediation has seen a marked shift from the banking sector to the debt securities market, reflecting the combination of subdued cross-border banking activity in 2009-12 and portfolio investors' search for yield in a low-yield environment. The shift is particularly notable for emerging market corporate borrowers, where the amounts outstanding by nationality (based on location of headquarters) exceed the traditional residence-based amounts (Graph A, left-hand panel), indicating substantial offshore issuance not captured in conventional external debt statistics. See Chui et al (2014) for a more detailed description of borrower characteristics and exposures. 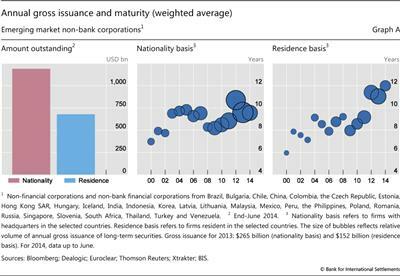 The average maturity of international debt securities newly issued by EME corporate borrowers has been increasing. The centre and right-hand panels of Graph A depict the amount and average maturity of gross issuance of international debt securities by EME non-bank corporates. The size of the bubble represents the dollar amount while the height of the bubble represents average maturity weighted by issuance amount. 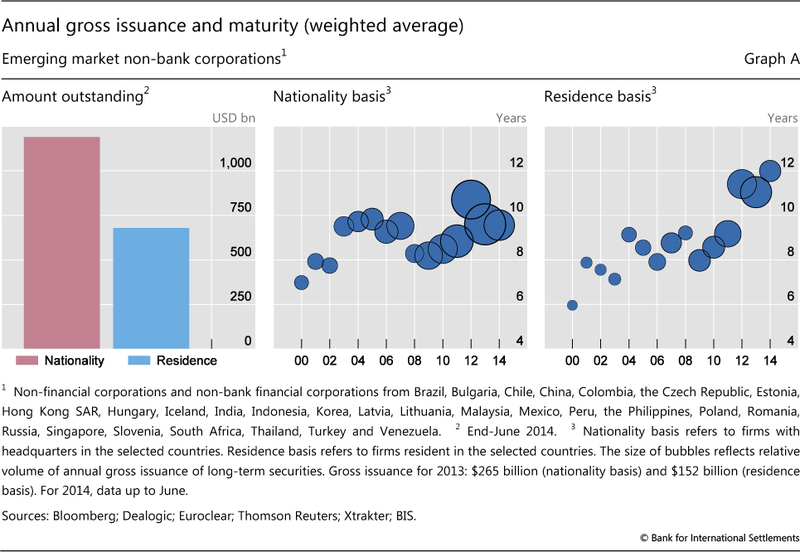 Graph A shows increased issuance amounts in recent years (larger bubbles) as well as longer maturities, especially for the residence-based series. In terms of the stock of outstanding debt securities by residence, the average remaining maturity excluding money market instruments now exceeds eight years. Longer maturities mitigate rollover risk for borrowers, but this is achieved at the expense of greater sensitivity of bond prices to yield changes - greater duration risk for the lender. Although many bond investors such as institutional investors do not operate with much leverage, if any, they may be susceptible to leverage-like behaviour if they are subject to risk limits, are sensitive to relative performance metrics, or engage in dynamic hedging to offset losses from option selling and other return-enhancing practices. To the extent that investor reactions amplify market disruptions, longer maturities may introduce new vulnerabilities with the potential to affect the availability and cost of finance. These issues are examined in more detail in Miyajima and Shim (2014). The projected redemption schedules for EME non-bank corporates based on international debt securities issued to date indicate that redemptions will peak in 2017-18. 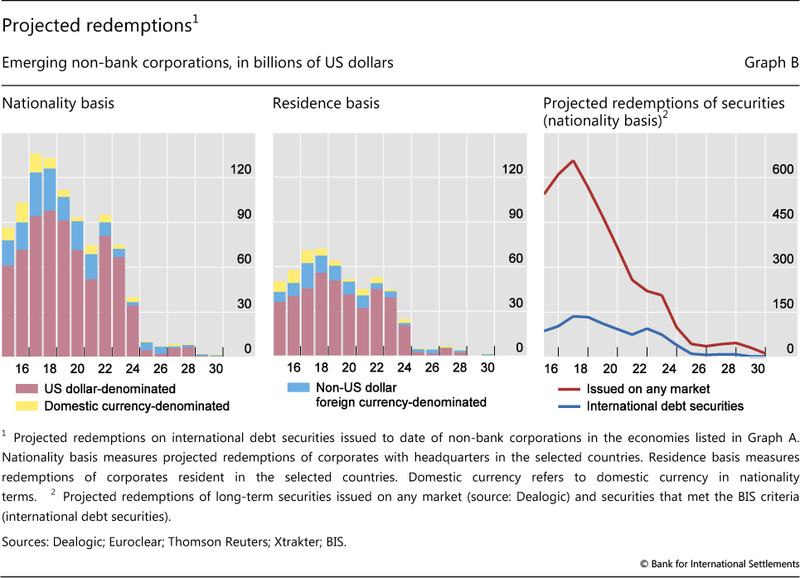 For international debt securities, redemptions in US dollars take the lion's share (Graph B, left-hand and centre panels). This represents a potential vulnerability. Many emerging market borrowers, such as commodity exporters, will have US dollar cash flow to offset coupon payments, as detailed in Chui et al (2014). Nevertheless, currency hedging of principal redemptions may be incomplete even for such borrowers. To the extent that market disruptions are made worse by duration risk, lengthening maturities may have the perverse effect of exacerbating rollover problems if the US dollar debt securities market shuts down in a distress episode. It should be remembered that the dollar market for emerging market issuers all but closed between September and October in 2008 and in January 2009, and again for several weeks in mid-2013. International debt securities constitute around 20% of total debt securities in terms of amounts outstanding. 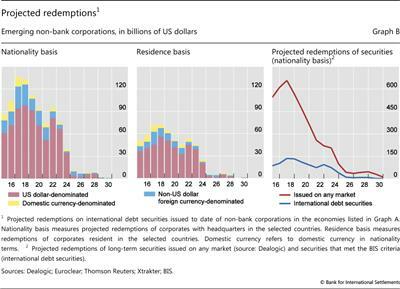 , Graph B (right-hand panel) shows the projected redemptions of international debt securities relative to redemptions of all debt securities, including domestic issuance. Domestic debt securities are denominated mainly in the domestic currency, eliminating the immediate risk from currency mismatch. However, as international investors have ventured further into the market for domestic debt securities, even this market may not be immune to disruptions arising from exits by global investors. While solvency is less of a problem with non-leveraged investors, the broader macroeconomic impact of capital market disruptions may impose significant costs on the economy through slower growth and tighter financial conditions. For these reasons, recent trends in the debt securities market and the changing pattern of credit intermediation merit attention from policymakers. M Chui, I Fender and V Sushko, "Risks related to EME corporate balance sheets: the role of leverage and currency mismatch", BIS Quarterly Review, September 2014, pp 35-47. The BIS classifies a debt security as international (IDS) if any one of the following characteristics is different from the country of residence of the issuer: country where the security is registered, law governing the issue, or market where the issue is listed. All other securities are classified as domestic (DDS). See B Gruić and P Wooldridge, "Enhancements to the BIS debt securities statistics", BIS Quarterly Review, December 2012, pp 63-76. K Miyajima and I Shim, "Asset managers in emerging market economies", BIS Quarterly Review, September 2014, 19-33. Investments in debt securities by non-residents account for roughly one quarter of the stock of global debt securities, with domestic investors accounting for the remaining 75%. See B Gruić and A Schrimpf, "Cross-border investments in global debt markets since the crisis", BIS Quarterly Review, March 2014, pp 18-19. For the economies listed, share of outstanding IDS by residence at end-2013 was around 1% in long-term series on credit to the private non-financial sector. See C Dembiermont, M Drehmann and S Muksakunratana, "How much does the private sector really borrow - a new database for total credit to the private non-financial sector", BIS Quarterly Review, March 2013, pp 65-81. It is reasonable to assume that large non-financial corporates in the economies tap international debt securities market.